Magnesium L-Threonate is a revolutionary dietary supplement containing an optimal dose of magnesium in the form of highly bioavailable of magnesium L-threonate. That form of the element is the most efficient when it comes to concentrating in the brain, it supports regenerative processes in damaged synapses, and helps to restore smooth information transmission between neurons, thanks to which it protects nervous system structures and enhances cognitive functions, for example by enhancing short- and long-term memory. Magnesium is one of the most important elements; along with potassium, it belongs to the basic intracellular cations of the organism. It is an activator of over 300 enzymes essential, for example, for normal carbohydrate and fat metabolism, exerts a cardioprotective effect by regulating blood pressure and stabilising cholesterol levels, as well as works as tonic for the nervous system – it calms down and increases the efficacy of brain functions. Magnesium L-threonate is a recently discovered magnesium compound that crosses the blood-brain barrier easily. Supplementing it is beneficial mainly for the brain and the nervous system, giving effects which cannot be achieved with traditional forms of magnesium. Even in the case of intravenous administration, only small amounts of magnesium reach the brain. Magnesium L-threonate is not only absorbed well from the digestive system, but it is also possible to concentrate its large amounts in the brain; moreover, using it is connected with a reduced risk of diarrhoea, unlike other forms. Although rich sources of magnesium are very common in everyday diets, it is very easy to experience its deficiency, as many factors affect its limited bioavailability and excretion – stress, intensive physical activity, drugs (oral contraceptives, diuretics, antibiotics, cytostatics), some chemical substances (alcohol, coffee), diseases (diabetes, hyperthyroidism, kidney diseases with reabsorption disorders), diet (products containing significant amounts of fluorides, tannins, heavy metal salts, dietary fibre, oxalic acid). The symptoms of magnesium deficiency are numerous and systematic; the most frequently observed ones are, for example: painful muscle cramps (usually in calves), eye twitching, arterial hypertension, the feeling of fatigue, cognitive function disorders, mood swings. Because magnesium optimises the functioning of the nervous system, its insufficient amount in the organism has a particularly negative effect on cognitive functions and can lead to weaker nerve cell regeneration and their faster aging. Magnesium deficiencies can be a reason of such symptoms as: apathy, difficulty falling asleep, a low mood, deteriorated ability to concentrate and remember, depression. It has been demonstrated that magnesium L-threonate helps to repair damaged synapses, that is the places where nerve impulses are transmitted from one neuron to another or to executive organs (glands, muscles). In the case of synapse damage, information transmission is significantly limited, which leads to disorders in the functioning of nerve cells and can be a reason for the deterioration of memory and the ability to remember. One of the disorders where synapse damage occurs is Alzheimer’s disease. It is a neurodegenerative disease of the central nervous system connected, among other things, with excessive deposition of beta-amyloid in extrasynaptic space, which leads to neuron damage and, as a result, to memory and personality disorders and deteriorated cognitive functions. Scientific research has demonstrated that using magnesium L-threonate can lead to a significant improvement of short- and long-term memory. The improvement of cognitive functions and the ability to remember can happen through the restoration of damaged synapses, and that is possible with this form of magnesium. Magnesium helps to maintain the fluidity of cell membranes, thanks to which it has an indirect modulatory effect on neurotransmission. Its participation in pathophysiology of the major depressive disorder (MDD) is connected mainly with its influence on the activity of N-methyl-D-aspartate receptors (NMDA) and gamma-aminobutyric acid (GABA)-binding receptors. Many scientists highlight the importance of NMDA receptors both in the pathogenesis of depression and in MDD therapy. That is why it has been observed that the agonists of the receptor (including magnesium) exhibit antidepressant effects and can have the ability to modulate the activity of other neurotransmission systems – dopaminergic, noradrenergic, and serotonergic system. Therefore, magnesium deficiencies can be closely-knit with the development of depression. 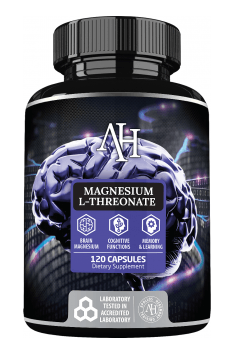 To sum up, Magnesium L-Threonate is a dietary supplement that efficiently crosses the blood-brain barrier and helps to increase magnesium levels in brain tissue. Magnesium L-threonate supplementation is beneficial for various aspects of health, including synaptic density and plasticity, thanks to which it increases energy in the brain and can prove extremely helpful both when it comes to improving cognitive functions, for example in the case of intensive intellectual effort, and in progressing neurodegenerative processes connected with aging. One of the tools that verify the quality and safety of a dietary supplement and the reliability of information on the label is to test it in an external, certified laboratory. In the interests of conscious supplementation by our clients, the supplement was subjected to accredited analysis in the independent J.S. 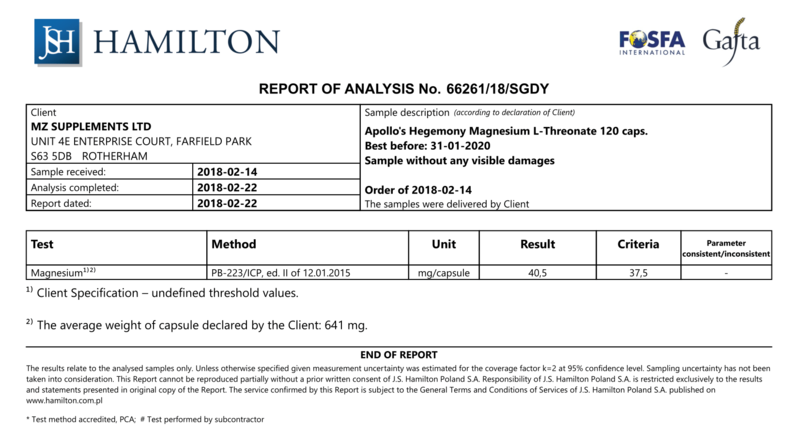 Hamilton laboratory to assess fully its quality and check whether the composition declared by the manufacturer is valid. Rewelacyjny magnez!!! Biorę wieczorem. Ułatwia zasypianie, rozluźnia.... Super! Produkt wart swojej ceny. Polecam!!! Adults should take 1-2 g of magnesium L-threonate a day (2-4 capsules), with or without a meal. It can seem to be a rather large dose but remember that 2,000 mg of magnesium L-threonate contains only about 140 mg of elemental magnesium. In order to improve cognitive functions, the preparation can be combined with oxiracetam. That combination lets you achieve even greater brain plasticity, which, in turn, is connected with an improved ability to remember, adapt and regenerate. Some research suggests that the form of magnesium can become even more available when consumed with milk.